Baum Squad: The Baum Family Blog: Chalk and/or Magnetic Paint? Just dropping in for a quick moment to see if anyone has any advice on chalkboard and/or magnetic paint! We finally sold our guest bedroom furniture and purchased what we think is an awesome alternative for our guest-bedroom-slash-playroom (thanks to Adria for the suggestion!). More on that in some other post once the project has been completed, but if you follow me on Pinterest I'm sure you've noticed that I've been pinning away with lots of neat ideas (I have a total love/hate relationship with that site...Dan's relationship with it is very much hate/hate, mainly because it creates a lot of work for him, ha!). Dan brought up a good point, though, with the chalkboard being on the wall: will it be super messy and ruin my carpet? And let's not even think of telling him that I said he had a good point, I don't need it going to his head. It should also be noted that when I told him we could easily solve that problem by tearing up the carpet and putting down hard wood in that room, his eyes rolled further back in his head than I have ever seen. Ugh, men. Anyway, I digress. I have done a lot of googling on this matter and have read opinions both ways, but the general consensus seems to be that it may be a terrible idea, not only for carpet-ruining/staining purposes but for wall-staining (or in my case, base board-staining) purposes as well. My next thought was: okay, whatever, I'll just stick with the magnetic paint since I was considering getting L an easel for Christmas anyway (which I can put a fun mat under for chalk/paint/whatever else messes). However, a little googling produced mixed results on magnetic paint as well, the two main complaints being that (1) it is a weird texture and leaves your walls looking weird and (2) it doesn't actually work. Additionally, I read horror stories about if you ever want to paint over either option (but there were just as many who had no problems). SO, my friends, the question is this: does anyone have experience with either of these very popular trends? I want to hear it all: the good, the bad, the ugly. Or if you've run across something about it from a source you know or trust, I'll take that as well. Operation guest bedroom/playroom project will be underway shortly, and I'm so excited! I've been thinking about doing the same thing! I'm hoping you get lots of good feedback. Following. Eeek, so far I have gotten some excellent comments but they have all been on Facebook! The reviews are still mixed, though. The people who have one love it, but some have said it definitely does stain the carpet. Another thing someone brought up is that when baby#2 gets here and is using the playroom in conjunction with L, it will be hard to teach him which walls you can and can't draw on since he'll have access to it younger. I think I am leaning towards an easel instead of the chalkboard paint but maybe still trying to do some magnetic paint or even a magnetic sheet (another suggestion) from a hardware store on the wall. So many decisions! We have a magnetic chalkboard framed in our kitchen. It high enough that the girls can't get to it, but E can draw on it when she's standing on a chair (it's really more for me). 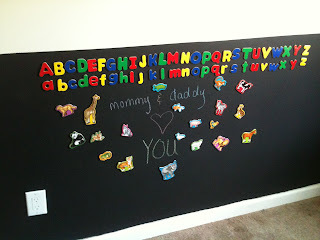 It is made of a big metal sheet rather than the paint and I used chalkboard paint, but I would use chalkboard contact paper if I had to do it all over again. Carney told me you'd have some suggestions on this! I think I have decided not to do any kind of wall because the general consensus is that it will probably ruin my carpet, not to mention how will I teach #2 which walls he can and can't draw on? One one of the blogs I follow I found where she converted a coffee table and did the top of that as chalkboard paint, so I think that is the direction I'm leaning. I wonder if contact paper would still work in that situation. 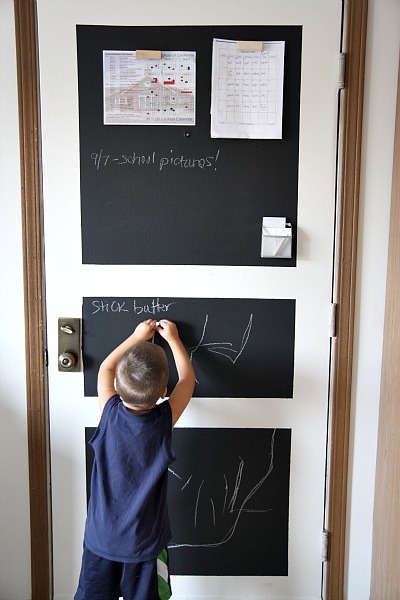 I love the idea of magnetic chalkboard wall. But I am quite hesitant to do it because of the dust that it might bring. 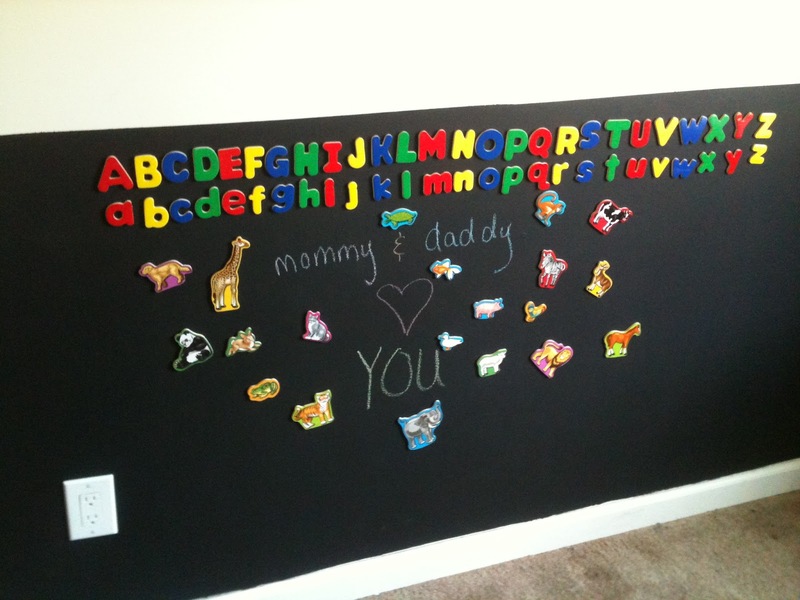 And I guess it is laborious to have a magnetic chalkboard, right? I think we have decided against a wall for that very reason. I think what I've decided to do is convert my old coffee table into an activity table for the little one and paint the top of it with chalkboard paint. Still not sure where magnetic paint will come into play but I haven't ruled that out because I do want L to have an area to play with magnets!